Visit Pietrabruna during your stay in Liguria, Italy. Marked hiking and mountain bike trails run through the lush vegetation of the surrounding area up to Monte Faudo (1150 m), to the Pilgrimage Church Santa Brigida and to the beautiful neighbouring villages of Boscomare, Torre Paponi and Civezza. Stretch yourself to the limit while climbing the steep walls around Triora or experience the Italian lifestyle and many leisure opportunities at the near coast. The story of the village goes back to the year 1103 and buildings from different Epochs excite every visitor here. The Roman Church of San Gregorio from the 12th century and also the Community Church of San Matteo, which was once considered as the sole example of a classical building in this area, are very well maintained. In addition, the village has a small museum, which tells the story of the village, the residents and their daily life. Historical objects and photographs are exhibited there. Within the locality there is a grocery store, a small bar, a Trattoria and two restaurants with wonderful ligurian cuisine. The regional recipes are outstanding. Pietrabruna is an ideal starting point for a tour around the Blumenriviera in all its facets and for an unforgettable vacation in a holiday house or a holiday apartment! Pietrabruna is a municipality with 546 in inhabitants in the Imperia province, and is almost 17 km from the provincial capital. Only 10 km away from the popular sand beaches in San Lorenzo al Mare lies the idyllic mountain village between silver glimmering olive groves in the Liguria’s hinterland. Up there on the slopes of 1159 metre high Monte Faudo, the dreamy village draws the visitor in its wake and captivates him with its breath-taking view and the stillness of the mountains. In addition, the medieval village captivates with its lovely restored natural stone houses and narrow, winding lanes. The Italian story can be felt here in every small road. 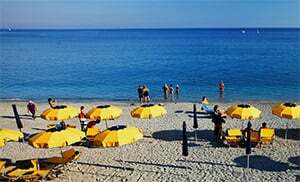 Pietrabruna belongs to the San Lorenzo al Mare municipality and is a village in Imperia province which lies in the Liguria region. In the vicinity of Pietrabruna are several other villages like: Civezza (13.9 km),Linguegliettta (8.1 km) and Boscomare (4.1 km). From Genoa take the Imperia Ovest highway exit and follow the SP45 towards Pietrabruna.